All of reality comes under attack when a mysterious force of entropy begins slowly erasing time itself—making its way from both the past and future toward the present! As history itself unravels around them, the heroes of the world–including Superman, Batman, Wonder Woman, The Flash, the Justice Society and the Titans—scramble to fix the broken time stream. But even if they stop the true source of the chaos, the world they save will never be the same! Collects ZERO HOUR #0-4 in hardcover for the first time. Includes a new introduction by Dan Jurgens, updated timeline to the DC Universe and never-before-collected bonus material. The solicitations have it as $25 which will probably put it around £20 over here. I might just treat myself, you know. Huh. I guess this is coming about because of the Doomsday Clock stuff and the mentions of ZH lately in recent storylines. I have the softer collected trade from back then and it has those Showcase issues included with it, plus the timeline in the back. I always enjoyed looking at that thing every so often back in the day, even though I understood how inherently redonkulous it was for the official continuity back then to say Superman and the JL had only really been around for 10 years as public superheroes. 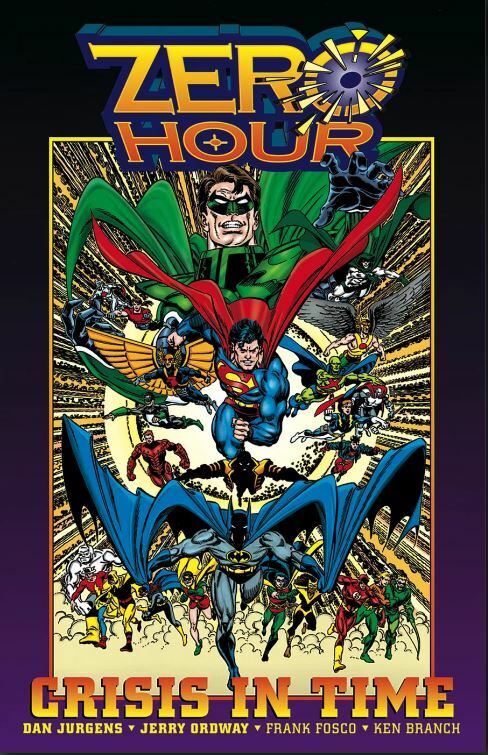 Still, Zero Hour was my CRISIS back then, before I ever even read CRISIS, so it definitely mattered to me. I remember when that infamous cover with Wally’s torn cowl on the cover, ZH#4 , came out and the massive speculation that he’d get killed off since apparently that’s the trend with these CRISIS events, a Flash has to do die. Thankfully he didn’t, but damn if that cover wasn’t the very definition of what we refer to on the web as Click-Bait. Likewise I’m curious what that “Never-collected-before-material” is exactly. I can’t even find a listing of it on Amazon yet. Yeah, Zero Hour was the first big, cosmic scale event I read after getting back in to comics. I missed the original Crisis, caught some of Invasion! and then it was the annual crossovers like Armageddon 2001 and Eclipso that I read before Zero Hour came along and wiped the slate clean (sort of). I think because of that, like I say, I have a good deal of fondness for the story, plus I’ve always enjoyed Jurgens as an artist. I think I might pick this up; I’ll let you know what the other stuff is once I get it! What I don’t get is since Jurgens did such a good job with ZH, both with the story and art, why DC could’t have just left it at that if ZH was intended to clean up the residual mess from CRISIS. DC editorial wanted the JSA gone, so Jurgens retired them, mostly with dignity outside of killing off Dr. Mid-nite, The Atom, and Hourman. They wanted to clean up the remnants of CRISIS, which I guess they did (I know there was supposedly some timeline/continuity issues left, as was referenced in some issues at the time, like for example at the end JLE#50, Hal mentions to Jay Garrick how he remembers having dinner with Jay when he was younger, pre-those annual JLA/JSA team-ups, and Jay says yeah, but wait, how can that be?) but then DC never could resist picking at an old wound, and then 4 years later, Hypertime is introduced, which essentially negates CRISIS and ZH. I dug out my copy of JLE #50 (which also had Dr Mid-Nite and Bloodwynd saying they sort of recognised each other – that was never referenced again, as far as I know) and yeah, that Flash/GL exchange felt like it was meant to go somewhere and never did. And then a couple of years later it’s Infinite Crisis, 52, and the restoration of the multiverse! And then Morrison decides to bring Hypertime back…..and once again it “exists”, but only when DC chooses to acknowledge it. I don’t own a copy of JLE#50 anymore, but yeah, that whole exchange between Hal and Jay was just straight up weird. Like whaaaaaa? And you say McNider and “Bloodwynd” had a similar exchange huh? Now either it was related to the Jay/Hal conversation, or it was a small bit leading up to the eventual reveal that “Bloodwynd” was really J’onn the whole time. Maybe McNider “recognized” J’onn somehow? Eh, we’ll never know.